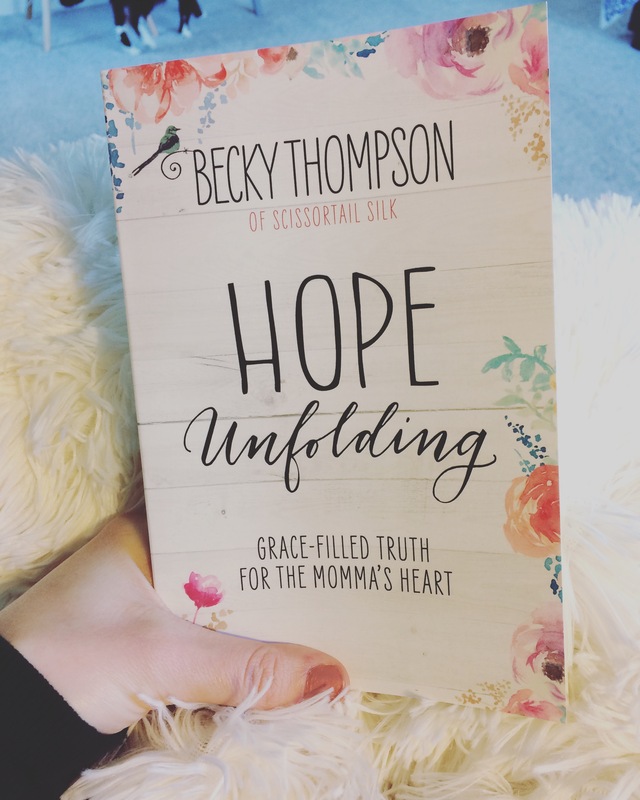 I just finished reading the book “Hope Unfolding,” by Becky Thompson (of Scissortail Silk), and it was hands-down one of the best books I have read. I have been awful at blogging lately, but I think it’s because I have so many things I want to blog about but I never just sit down and write. But, this book was so good, I had to share it with you. I know I have lots of mama friends, and I know that this book might just be the thing you need to read today, too. I laughed and cried as I read Becky’s story of her life, and the situations that she talks about, and found myself relating to her in many different ways. This book is a quick read, and I actually had to will myself to put it down so that I wouldn’t finish it too quickly! Sometimes, I read so quickly and don’t really let things fully sink in, and I didn’t want that to be the case with this book. The book, “Hope Unfolding” is full of truth. It could just be that when I was reading this book, the timing was perfect for where I am in my life, but, I felt that multiple times throughout the book, the author was looking right into my heart and speaking directly to me. I love how God uses all sorts of ways to connect with us, and even though I felt that I randomly put this book into my Amazon cart, I know He didn’t see it as random at all. Here’s the thing — being a mom is hard. It is an often overlooked “job”, a job without pay, and often without gratitude. But, it’s also the most rewarding role I’ve ever played in my life. I, probably much like you, find myself randomly scrolling through my Instagram feed, and noticing all of those moms that have it all put together. They have the cutest kids, the fanciest houses, and they have that perfect side business or Etsy shop that fuels their passion and allows them to even make some money while staying at home with their kiddos. But here’s the other thing — this type of comparison will eat away at me if I let it. Becky’s book reminded me to keep my focus where it needs to be, and that no one can really do it all, and be it all, and we shouldn’t feel that we need to be constantly put-together. I love social media, and it inspires me and fuels my creative side, but it can also be a spot where I forget that I am me, because God made me that way, and that that is 100% enough. I love the Instagram feeds that show nothing but beautiful pictures, the ones that make you catch your breath sometimes. But, how real is that? Probably, not very. The truth is that we are not perfect, and in constant need of grace and hope that can only come from Jesus. A lot of the points made in this book are things I have been told over and over again in my life. I was raised going to church and Sunday School, and I know that God loves me. I know that I’m not forgotten, that I’m unique and that God has an intricate plan for my life. But, sometimes, I need to be hit over the head with these truths. When I think about all that we walked through as a family in this past year and a half, it is overwhelming, and oftentimes confusing. And truthfully, it would be so easy to let the lies that the Enemy tries to speak into my soul become a reality in my thoughts. This book was a great reminder of where truth can be found. A million intricately placed moments. Nothing by chance. I am mom to my two exact children, because I am the mom He planned for them. I am my parent’s daughter by unique design and my two sisters are the ones He had planned out for me before I was even born. I am the wife that He planned for Bryan, and the challenges we have faced, and continue to face are not a surprise to Him. Just like we run to our kiddos when they call us, regardless of what they do or don’t do, the same is true for how God sees us. I’ll say it again — being a mom is hard. But it becomes a lot less difficult when we can surrender it all to Jesus, knowing that there is hope and grace on the other side of all the mistakes we’ve already made and will continue to make. It feels so good to surrender my plans, my agenda and every single one of my worries to Him, knowing full well that He will care for me far better than I ever could. The freedom that I feel from stopping that comparison, and believing that His plans are perfect, is a wonderful feeling. It definitely is a constant thing for me. I continually have to stop those thoughts, those lies, when I catch myself thinking them, and speak the things I know to be true in my heart instead. I don’t have it all together, and I truthfully, I think we’re all a work in progress. Life isn’t always easy and doesn’t always feel safe, but I am rejoicing in the fact that I know He’s got it all in His hands. Every diaper change, every tear, every laugh — He sees it all and He can and will meet you in the midst of it. We’re all in this together, mamas, and I’m cheering you on! And, with that, hop over to my Facebook page, for a quick little giveaway with this book! On a somewhat related note, Bryan has a follow-up appointment next week with his oncologist, and we would love continued prayers for his health. I’ll be back to post an update on him, and life lately soon!